HalfLemon Pop-up Alert is associated with Windows Police Pro, the rogue antispyware application, and is indeed a fake security notification, as its sole purpose is to redirect an unsuspecting user to the affiliated website of this rogue, and to ensure the user ends up purchasing the rogue security tool. This rogue, Windows Police Pro, has been doing the rounds online and will only cause havoc to all PC systems it infects. Being a rogue antispyware application, it pretends to be a useful security tool, portraying itself as the answer to your PC woes, when in fact it is actually the cause of many a PC woe, and is best to remove Windows Police Pro and all its components, ASAP!. Your computer is being attacked by an Internet Virus. It could be a password-stealing attack, a Trojan-dropper or similar. Do you want Windows Police Pro to block this attack? If a computer system does in fact have this pop-up alert appear, it is a clear sign of the presence of Windows Police Pro, and the next step would be to rid the system of all things associated with this dubious application. It is quite apparent that the HalfLemon Pop-up Alert is a fake error message and should NEVER be trusted. 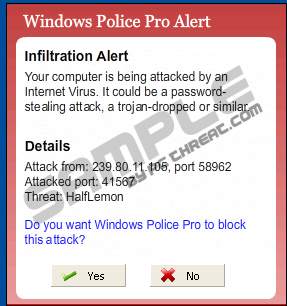 Should a user be experiencing HalfLemon Pop-up Alert, they will need to remove the rogue Windows Police Pro and all its affiliates from the infected system. The best thing to do when faced with the problem of HalfLemon Pop-up Alert would be to make use of a legitimate antispyware application, this way ensuring the automatic removal of this rogue HalfLemon Pop-up Alert and all its affiliated components. Quick & tested solution for HalfLemon Pop-up Alert removal.